Continue on to see the full rules and contest info and also a look at some created fighters made by the community, including The Undertaker, Spiderman, and Manny Pacquiao. If you’ve created a spectacular fighter in EA SPORTS UFC 2 this is your opportunity to show it off to the world for a chance to win some great prizes. We’re looking for entries of all shapes and sizes, from fantasy characters to real-world lookalikes, we want to see them all! 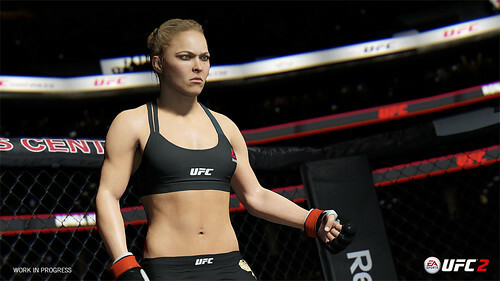 Taking character customization to the next level, EA SPORTS UFC 2’s Fighter Creation tool goes deeper than ever with robust facial sculpting, tattoo customizations and for the first time, the ability to create female fighters. Players can also sculpt their own GameFace uploads to perfection…before they get touched up in the Octagon. Copies of EA SPORTS UFC 2, FIFA 16, Madden NFL 16, NBA LIVE 16, NHL 16, and Rory Mcilroy PGA Tour. We will upload the Top 10 submissions to the EA SPORTS UFC Facebook page on Tuesday, April 12, 2016. Fans can vote for their favorite submission(s) by hitting LIKE and/or SHARE until April 18, 2016 @ 10:00am PT. We will upload the Top 5 voted submissions for a final round of voting on April 18, 2016. This final round of voting will take place from April 18 – April 25, 2016. Cast your vote by once again hitting LIKE and/or SHARE. The submission with the most LIKES & SHARES in the final round of voting will take home our 1st Place Prize. Final round voting ends April 25, 2016 @ 1:00pm PT. *EA SPORTS reserves the right to not upload or remove an image submitted at any time if we consider it unsportsmanlike.